The prophetic Book of Daniel is divinely designed. There is meaning and revelation embedded in its very structure. This book was sealed until the time of the end. Today we’re going to explore the divine design of the Book of Daniel. The Book of Daniel is a prophetic book. It has a fascinating structure that actually conveys meaning. The book’s structure enhances and reinforces the key themes and messages of the book. The Book of Daniel was written in two languages: Aramaic and Classical Hebrew. This was by divine design. Each language signals something different. Each of the two portions of the book should be approached with a slightly differently expectation. The Aramaic section is more straightforward, with great stories that work well in the oral tradition. The Hebrew section is more complex, less easily accessible, and requires much more study to grasp its key messages. The Book of Daniel was sealed for a long time, unlike the Book of Revelation. The difference between the two books is that the Book of Daniel is a prophecy whereas the Book of Revelation is a revelation. Portions of the Book of Daniel were sealed until the time of the end. The Book of Revelation was never sealed. How do we know that? We read in Revelation 22:10: “And he (the angel) said to me (John the Revelator), “Do not seal the words of the prophecy of this book, for the time is at hand”. Now let’s contrast that with what the angel told the prophet Daniel: “But you, Daniel, shut up the words, and seal the book until the time of the end; many shall run to and fro, and knowledge shall increase” (Daniel 12:4). In the Adventist historicist method of Bible prophecy, it’s generally admitted that the time of the end began in 1798 at the time of the deadly wound. The Book of Daniel began to be unsealed by the Millerite movement in the 1830’s and 1840’s. As they studied the 2300-Day Prophecy of Daniel 8, they initially thought it referred to Jesus’ Second Coming. They ultimately realized that the prophecy referred to the cleansing of the heavenly sanctuary in 1844. After the Great Disappointment they discovered the amazing truth of how the final judgment unfolds. between Jesus and Satan and contains three powerful future time prophecies that take us to the very end of time. It also contains a serious warning for God’s people. In order to better understand and receive the light God has for us in this book, it’s very helpful to understand the overall structure of the Book of Daniel. We’re going to start with the Aramaic portion – we’ll cover that today. Our next study will be devoted to the Hebrew portion. In Revelation 10 the Angel of the Covenant held in His hand a little book when He asked John to prophesy again. That little book is the Hebrew portion of the Book of Daniel. This is the portion of the book that the Millerites began to unseal in the 1800’s. We need to completely unseal that little book in order to reveal all the light the Lord has for our generation. It’s amazing how this book has been architected by divine design. I’ve been blessed by this study and know you’ll be as well. Let’s get started! Before we delve into the divine structure of the Book of Daniel, let’s take a moment to consider the timing of the complete unsealing of this book. We read in Daniel 12:4: “But you, Daniel, shut up the words, and seal the book until the time of the end”. When is the time of the end? We said earlier that Adventists believe that “the time of the end” began in 1798. What evidence do we have for that? Let’s go to Daniel 7:25 where it says that God’s saints would be given into the hand of anti-christ during “a time, times, and an half”. This “time, times and an half” is literally 3.5 years. This time period is expressed in prophetic time (applying the day for a year principle) and refers to the 1260 years of papal dominion. Papal dominion ended in 1798 with the receiving of the deadly wound by the sword. Therefore “the time of the end” is believed to have started in 1798. But listen to this incredibly interesting statement by Sister Ellen White: “Let us read and study the twelfth chapter of Daniel. It is a warning that we shall all need to understand before the time of the end” (Manuscript Releases Volume 15 page 228). These manuscripts were published around 1888, almost a century after 1798. So she’s talking about a “time of the end” that’s still future in 1888. Indeed, Daniel 12:7 talks about a literal “time, times and an half” or 3.5 years that’s still future. Clearly then there are two “times of the end”: one that begins in 1798 and one that began or begins in our generation. “4 But thou, O Daniel, shut up the words, and seal the book, even to the time of the end: many shall run to and fro, and knowledge shall be increased. 5 Then I Daniel looked, and, behold, there stood other two, the one on this side of the bank of the river, and the other on that side of the bank of the river. 6 And one said to the man clothed in linen, which was upon the waters of the river, How long shall it be to the end of these wonders? 7 And I heard the man clothed in linen, which was upon the waters of the river, when he held up his right hand and his left hand unto heaven, and sware by him that liveth for ever that it shall be for a time, times, and an half; and when he shall have accomplished to scatter the power of the holy people, all these things shall be finished” (Daniel 12:5-7). The man clothed in linen is Jesus, the Angel of the Covenant in Daniel 12 who swears by God that the limit is 3.5 literal years. So the second “time of the end” is the real end, when all these things shall be finished. Which things? The things that relate to the Great Controversy between Jesus and Satan, especially those narrated in the storyline of the Hebrew section of the Book of Daniel. In other words, the unsealing of the Book of Daniel would take place in two phases: during the effervescence of the Millerite movement and during the real deal, the final “time of the end”, in our generation. Understanding the structure of the Book of Daniel is as important as understanding the structure of the Book of Revelation. God Himself architected both prophetic books by His divine wisdom. From the beginning of Chapter 1 until Chapter 2 verse 3 is written in Hebrew. From Chapter 2 verse 4 through to the end of Chapter 7 is written in Aramaic. The book picks up again in Hebrew from Chapter 8 through to the end of Chapter 12, the last chapter in the book. Why did the Holy Spirit inspire the Book of Daniel to be written in two different languages? Because God had two intended audiences for these books, and two intended times. Daniel was a well-known prophet, in fact Jesus references him in His Olivet discourse. The Aramaic stories were known and understood by the Jews in Jesus’ time. Early Church fathers in the 2nd. And 3rd. centuries understood very well the stories in the Aramaic book of Daniel. In contrast the Hebrew section of the book was closed and sealed until the time of the end, as we said earlier. It was intended for a later audience, God’s end time remnant. The Lord targeted in particular the post-1798 Millerites and the very last generation. The two books also have a slightly different nature. Very simplistically, after the northern tribes of Israel were scattered, Aramaic became an important spoken language. On the other hand Hebrew was the religious language used in all the religious texts. Classical Hebrew was considered more literary than Aramaic. This signals to us that the Aramaic portion of the book is easier to understand, whereas the Hebrew section is more challenging and requires more in-depth study. Classical Hebrew was the language of the priests. Therefore the very choice of language is a marker in itself, indicating the nature of the texts we’re dealing with. It wasn’t until the Millerite movement in the 1800’s that the chapters written in Hebrew began to be studied more carefully. And it’s only very recently that we’re starting to achieve a much clearer understanding of this prophetic book. To conclude: It’s no accident that the Book of Daniel is written in two languages. Who confounded the languages at the Tower of Babel? The Lord Himself. That this prophetic book is written half in Aramaic and half in Hebrew is part of God’s divine design. Therefore, as we consider the book, language is a key factor. If we ignore it we forfeit some of the revelation the Lord has for us. Now we’re ready to tackle the Aramaic section of the Book of Daniel. The Aramaic section of the Book of Daniel is filled with stories. All of the stories in the Aramaic section are prophetic. The same scenarios will be replayed at the end of time. Again, all the stories narrated in Daniel 2 – 7 are prophetic stories. Let me just throw in a disclaimer: In Daniel 2 there’s the very important prophecy of the statue that represented the succession of the world kingdoms until the kingdom of God. This succession of kingdoms plays a key part in the storyline of the Hebrew section. Well, the first three verses of that chapter are written in Hebrew. In this way the Lord provided a hook, linking this prophecy to the Hebrew portion of the book as well. What are those stories written in Aramaic that are so memorable that they’re great for oral transmission? They’re also rich with prophetic meaning. Let’s do a quick review. Chapter 1 of Daniel was written in Hebrew and by virtue of the language it absolutely belongs with that book. 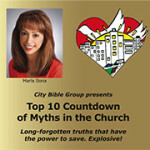 But Chapter 1 also serves as an introduction to the entire Book of Daniel, not only to the little book that was sealed. The key message of Chapter 1 is that diet has a direct impact on our intellectual capabilities: our knowledge, wisdom, skill, and understanding. This message about diet is relevant for the Aramaic section as well as the Hebrew section. The full import of this message about diet can only be understood by our generation. Why? Because, like no generation before, what we eat literally and spiritually can make the difference between life and death. Daniel and his friends arrive in Babylon to be apprentices in the king’s court. Listen to how the Bible describes them: “Children in whom was no blemish, but well favoured, and skillful in all wisdom, and cunning in knowledge, and understanding science, and such as had ability in them to stand in the king’s palace, and whom they might teach the learning and the tongue of the Chaldeans” (Daniel 1:4). “16 Thus Melzar (the prince of the eunuchs) took away the portion of their meat, and the wine that they should drink; and gave them pulse. 20 And in all matters of wisdom and understanding, that the king enquired of them, he found them ten times better than all the magicians and astrologers that were in all his realm” (Daniel 1:16-20). We’re going to see just now that a vegan diet plays a key role in most of the stories in the Aramaic section. Diet is not only a key to wisdom and understanding, but also a contributing factor to spiritual purity and faithfulness to God. For our generation, having the proper diet will be one of the determining factors in our being able to stand faithful to God in the hour of trial. (Before I start talking about King Nebuchadnezzar, I did a recent program on him and how his story is relevant for us today. Recommend you listen to “God Has a Plan for Your Life – Part 2”). King Nebuchadnezzar has a dream but his spirit was troubled. He knew the dream is important but can’t remember any of it. He called all of the wise men but they couldn’t tell him the dream nor the interpretation of the dream. The king issued a death decree against all of the wise men of the court for their incompetence. Daniel and his friends prayed to the Lord who revealed to Daniel both the dream and the interpretation of the dream. The dream was of a gigantic statue which had the head of gold, the chest and arms of silver, the belly and thighs of bronze, the legs of iron and the feet of iron mingled with clay. Each successive metal represented a kingdom that was inferior in quality to the preceding one. The dream ended with a huge stone cut out without hands that crashed into the statue and shattered it to pieces. The stone then became a great mountain that filled the whole earth. The interpretation was that the statue represented the succession of world kingdoms until God’s kingdom would destroy and replace all world kingdoms. When Daniel gave the revelation to King Nebuchadnezzar he promoted Daniel and his friends to very key positions in the administration of his kingdom. The Lord had given Nebuchadnezzar an amazing blessing with this revelation. He had revealed to King Nebuchadnezzar the succession of world kingdoms until the kingdom of God. But the Lord caused him to forget the dream so that Nebuchadnezzar would realize his need for God. This prophecy is one of the most important prophecies in the Bible. History has unfolded exactly as foretold by Daniel. We’re currently positioned on the toes of that statue, on the brink of the shattering of the statue and the establishment of God’s kingdom. Nebuchadnezzar wasn’t happy with the revelation that his kingdom would come to an end and be replaced with other world empires. So he had a statue built entirely of gold and ordered everyone in his kingdom to bow down and worship the statue in the Valley of Dura. In the same way that Daniel’s friends had refused to eat the king’s delicacies in Chapter 1, they also refused to worship the statue under penalty of death. They were threatened that they’d be thrown into a fiery furnace that was heated up 7 times higher than normal. But the three young men didn’t flinch. They stood faithful to God during their test and were cast into the fiery furnace. Jesus delivered the 3 young Hebrew men from the fiery furnace for refusing to worship the golden image in the Valley of Dura. This story is a preview of the imposition of false worship, Sunday worship, in a very short time. The mark of the beast will be imposed with a death penalty for non-compliance. But this story is also an encouragement to God’s remnant people that if they remain faithful to Him and don’t take the mark of the beast, they’ll be delivered. By commanding worship for the entire kingdom Nebuchadnezzar effectively united church and state and became leader of both. In just a very short time anti-christ is going to become the single leader of both the New World Order and One World Religion. The passage stresses how Nebuchadnezzar’s entire administration was involved in this. Several times the text mentions “the satraps, the administrators, the governors, the counselors, the treasurers, the judges, the magistrates and all the officials of the provinces” were gathered together. This is exactly what happened during the Middle Ages with the Roman Catholic Church. The clergy became the de facto governance body of the medieval papal empire. As incredible as it may sound, this will be repeated in our generation. The impending financial collapse will catapult the world back hundreds of years, back to a barter economy. Daniel Chapter 3 also emphasizes the important role that music will play in the imposition of false worship. Listen to this amazing passage: “4 Then a herald cried aloud: “To you it is commanded, O peoples, nations, and languages, 5 that at the time you hear the sound of the horn, flute, harp, lyre, and psaltery, in symphony with all kinds of music, you shall fall down and worship the gold image that King Nebuchadnezzar has set up; 6 and whoever does not fall down and worship shall be cast immediately into the midst of a burning fiery furnace. 7 So at that time, when all the people heard the sound of the horn, flute, harp, and lyre, in symphony with all kinds of music, all the people, nations, and languages fell down and worshiped the gold image which King Nebuchadnezzar had set up” (Daniel 3:4-7). Need I say more? Do you think that all the worldly music that has penetrated the church is completely random? Did you know that it all started with the Roman Catholic Church’s Second Vatican Council in the mid-60’s? Music is a key component of a very deliberate strategy to condition people’s behavior through sensory stimulation to create a certain kind of worship experience. It’s all about the experience. The experience is defined by the music, not the lyrics. The lyrics say worship God but the music says worship Satan. What is so terrifying is that this music has penetrated God’s remnant church as well. It’s a huge open door to the devil. In Daniel 4 we have the story of how Nebuchadnezzar was exiled from the throne of Babylon. Once again, the Lord gave Nebuchadnezzar a vision in a dream. In fact, the dream was a warning to the King for his pride. The wise men of the Babylonian court were summoned to interpret the dream, and only Daniel was found wise enough to give the king the interpretation. 34 And at the end of the time I, Nebuchadnezzar, lifted my eyes to heaven, and my understanding returned to me; and I blessed the Most High and praised and honored Him who lives forever”. Notice how eating grass brought Nebuchadnezzar to his senses. 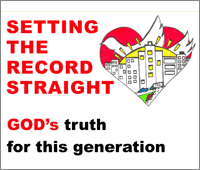 He had a true conversion experience and surrendered his heart to the Most High God. The change of diet is a very important detail in this conversion story. Here we have a third witness in the Book of Daniel as to the power of diet in our spiritual relationship with the Lord. King Belshazzar of Babylon was King Nebuchadnezzar’s grandson. One evening he offered a great feast for a thousand of his lords. 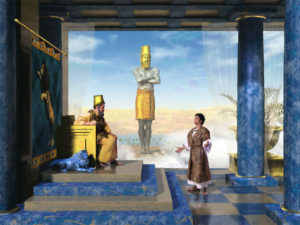 Although he knew of all the exploits of his grandfather as well as his conversion experience, Belshazzar ordered his servants to bring in the holy vessels that Nebuchadnezzar had brought back as spoils of war from the Jewish Temple. The king and his guests got drunk drinking in the holy vessels and profaned that which was sacred. “They drank wine, and praised the gods of gold and silver, bronze and iron, wood and stone.” (Daniel 5:4). The Bible says that in the same hour Babylon was judged. A hand appeared and wrote on the wall words of judgment against King Belshazzar. The king and his guests were terrified. Again Daniel was summoned to interpret the handwriting on the wall. Daniel rebuked the king for his pride. His heart was lifted up against the true God of heaven and he was worshipping the work of men’s hands. 26 This is the interpretation of each word. MENE: God has numbered your kingdom, and finished it; 27 TEKEL: You have been weighed in the balances, and found wanting; 28 PERES: Your kingdom has been divided, and given to the Medes and Persians” (Daniel 5:25-28). That very night, Belshazzar was killed. Cyrus of Persia and Darius the Mede invaded Babylon and took over the kingdom. Babylon was thought to be impregnable because she sat on the Euphrates River and was protected by water. How did they get in? Under the Lord’s guidance King Cyrus, the anointed of the Lord, redirected the Euphrates River and dried up the riverbed. Thus he was able to open the city gates to his soldiers and they penetrated the city. This is a very important story for us, generation of the end. First of all, we see the effect of wine on our spirit. After drinking wine the king and his guests couldn’t distinguish between the sacred and profane. This is exactly what happens when we drink the wine of spiritual Babylon, the Roman Church, the mother of harlots. She tramples upon God’s holy Sabbath but commands worship on Sunday, a common day with no sacredness whatsoever. Babylon’s fall also foreshadows the final destruction of the Roman papacy, also called “Mystery Babylon the Great”. The Bible tells us in Revelation 16 that the symbolic Euphrates River will dry up to prepare the way for the kings of the east, meaning Jesus and His retinue of angels. The symbolic Euphrates River represents the nations, multitudes and people that support the Roman Catholic Church. When the plagues start to fall, those who didn’t receive the love of the truth realize they’ve been deceived by the harlot. She can’t protect them from the plagues. Then we read in Revelation 18 about the judgment of the great whore. We need to give the loud cry that Babylon is fallen because she fornicated with the kings of the earth. “For her sins have reached to heaven, and God has remembered her iniquities. Come out of her My people, lest you share in her sins, and lest you receive of her plagues” (Revelation 18:4-5). Daniel had earned the respect of King Darius who had made him one of the three governors overseeing the Medo-Persian kingdom. Daniel was so faultless in his duties that the other two governors became jealous because the king was considering giving Daniel even higher authority. So the two governors conspired with the satraps – government officials – and other counselors to trap Daniel in some fault. They deceived the king into signing a royal decree that would prohibit men from petitioning any god or man other than the king, under penalty of being cast in the den of lions. When Daniel learned about the decree, he went home and prayed as normal, facing Jerusalem with his windows open. The government men denounced Daniel before the king, who regretted his mistake. But now he had no choice but to cast Daniel into a den of hungry lions. The king was up all night fasting. The next morning he rushed to the den to find Daniel well. The Lord’s Angel shut the lions’ mouths so that Daniel wasn’t hurt. Listen to this beautiful verse: “So Daniel was taken up out of the den, and no manner of hurt was found upon him, because he believed in his God” (Daniel 6:23). This story prefigures the end time union of church and state. The state will issue a decree against the free exercise of religion. God’s people will be betrayed and brought before the authorities for worshipping or praying to our God. The kings of the earth will be deceived by the Babylonian Church into signing these kinds of decrees, either imposing counterfeit Sunday worship or prohibiting true worship. And just as happened to Daniel and his three friends, there will be a death penalty for those who refuse to yield to the power of the state. Chapter 7 is the last chapter written in Aramaic. Chapter 7 is a transition chapter that’s slightly more complex than the preceding chapters. It sets the stage for the remaining chapters, written in Hebrew. In a night vision Daniel sees four beasts coming up out of a great sea. These beasts represented kingdoms. First he saw a lion with eagle’s wings, then a bear with three ribs in its mouth, then a leopard with four wings of a bird and four heads, and finally a fourth beast that was dreadful and terrible in strength. It was different from the others and had ten horns. The lion was the first and corresponds to the head of gold on the statue, symbolizing Babylon. The second was the bear representing Medo-Persia. The third was the leopard representing Greece. The last one represented Rome, the iron kingdom. Among the ten horns of the last kingdom would emerge a little horn with eyes and a mouth. The little horn would speak pompous words against the Most High, persecute the saints of the Most High and intend to change times and law. This little horn is anti-christ, or the papacy. The saints would be given into this hand for a time and times and half a time. This was 3.5 prophetic days, or 1260 years. The papacy ruled over Europe from 538 to 1798 and persecuted God’s saints with great cruelty. In this chapter we see that the little horn was and is judged for all of his crimes: for his blasphemous words against God, for persecuting God’s people, and for intending to change times and law. The times refer to God’s prophetic timeline, and the law refers to God’s Ten Commandments. This chapter also tells us about the beginning of the judgment in heaven. It introduces the Sanctuary which will also appear in Daniel 8 and 9, in the Hebrew section of the book. Daniel sees God’s throne in heaven. The court was seated and the books were opened to investigate the papacy’s record of wrong-doing. The prophet then sees Jesus joining the Ancient of Days and the Kingdom is given over to Him. The Bible tells us that the papacy was found guilty. The sentence was that its dominion will be taken away and its body consumed with burning fire. Then judgment will be pronounced in favor of God’s people and the time will come for them to possess the kingdom. “And the ten horns (the ten kings) which thou sawest upon the beast, these shall hate the whore, and shall make her desolate and naked, and shall eat her flesh, and burn her with fire” (Revelation 17:16). “7 How much she hath glorified herself, and lived deliciously, so much torment and sorrow give her: for she saith in her heart, I sit a queen, and am no widow, and shall see no sorrow. 8 Therefore shall her plagues come in one day, death, and mourning, and famine; and she shall be utterly burned with fire: for strong is the Lord God who judgeth her” (Revelation 18:7-8). What exactly is a chiastic structure or chiastic analysis? Let me reassure you, it’s not rocket science and it’s not something that only Bible scholars have access to. Don’t be intimidated by the big word. God intended for His remnant people to understand the scriptures and that includes being able to do a “big picture” analysis of His Word. I’m a big picture person and like to see how passages in the Bible connect at a higher level to bring forth deeper layers of truth. A chiasm (also called a chiasmus) is a literary device in which a sequence of ideas is presented and then repeated in a different form, sometimes in a different order. The result is a “mirror” effect as the ideas or concepts in one passage are “reflected” back in another passage. The term chiasm comes from the Greek letter chi, which looks like our letter X. Think of how two chromosomes are linked and you’ll visualize a chiastic relationship. A chiasm is very visual so it’s quite hard to describe with only words. Take a look at the images below. Let’s apply a chiastic structure to the Aramaic section of the Book of Daniel and see what we get in terms of themes. What we get are three strategic themes that are incredibly relevant for our generation today. Chapter 2 is linked with Chapter 7. The theme is the succession of world kingdoms. Chapter 2 is the vision of the statue containing the succession of world kingdoms until God’s Kingdom, and Chapter 7 is the vision of the beasts that represent the succession of world kingdoms until the kingdom is given to the saints of the Most High. See the repetition? We’ll see how in the Hebrew section the succession of world kingdoms is linked to the theme of the Great Controversy between Christ and Satan. Chapter 3 is linked with Chapter 6. The theme here is the end time persecution and the deliverance of God’s people from it. The 3 Hebrew young men are delivered from the fiery furnace because the state made a law to establish Daniel is thrown to the lions because the state made a law to prohibit the free exercise of religion. In both cases God’s people are delivered from their persecutor. Chapter 4 is linked with Chapter 5, the theme is the downfall of a king and a kingdom for pride. Chapter 4 describes how God brings down Nebuchadnezzar from the throne of Babylon for a season of 7 years. Chapter 5 describes how God removes the kingdom from his grandson Belshazzar and gives it to the Medes and Persians. Onœe fall echoes the other. In Nebuchadnezzar’s redemption story we are given a glimpse of God’s mercy. But we need to do our part by not drinking the wine of Babylon and going back to a pure Genesis diet. Beware Rome, Mystery Babylon the Great. You’re about to regain the absolute dominion you once had over the kings of the earth. You sit as a queen and think you’ll see no sorrow. But strong is the Lord God who judges you. God has passed sentence against you: “Reward her even as she rewarded you, and double unto her double according to her works: in the cup which she hath filled fill to her double” (Revelation 18:6). And the Lord is saying “Come out of her My people that you partake not of her sins and receive not of her plagues”. I pray that none of us listening to this podcast may be found in spiritual Babylon at the time of our judgment or hers. Make sure to come back for our next study in the Daniel series, focused on the Hebrew section of the book, aka “the little book” that had been sealed and opened. (Also visit our YouTube channel). 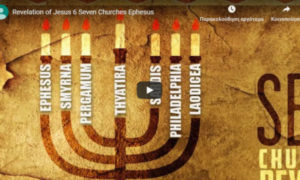 Tagged adventist, angel, anti-christ, Aramaic, Babylon, bear, beast, Belshazzar, Bible, book, bronze, burn, captivity, chapters, chiasm, chiastic, chiastic structure, clay, covenant, Cyrus, Daniel, Darius, death decree, decree, deliverance, den, diet, dominion, dragon, dragon beast, dreams, end, end time prophecies, end time prophecy, faithfulness, fiery furnace, fire, furnace, generation, genesis, genesis diet, gold, grass, handwriting, Hebrew, horn, investigative, investigative judgment, iron, Judgment, king cyrus, King Darius, King Nebuchadnezzar, Kingdom, kingdom of God, language, last, law, leopard, lion, lions, mark, mark of the beast, Medo-Persia, millerite, mystery, mystery babylon the great, Nebuchadnezzar, order, papacy, papal, papal empire, papal persecution, persecution, plagues, Pope, pope anti-christ, praying, prophecy, prophet, prophetic, prophetic statue, purity, record, religion, Revelation, Roman, Sabbath, satraps, seal, silver, skill, spirit, spiritual, statue, structure, succession, succession of world kingdoms, Sunday, temple, throne, time, understanding, unsealing, vegan, vegetarian, visions, white, wine, wine of babylon, wisdom, world, worship. Thank you for sharing your study with us. I found this informative and stimulating and look forward to further studying. God is leading and guiding in revealing these truths for the end time. I look forward to your next study!